Jay Z and Beyonce will cross paths once more at Kim Kardashian's wedding to Kanye West. Things could get hella-awkward at Kim Kardashian and Kanye West's wedding this weekend -- or not! Among the VIP guests confirmed to attend the blowout in France and Italy is West's close pal and collaborator Jay Z, whose wife, Beyonce, is still just a "maybe" for the European nuptials, Us Weekly can confirm. 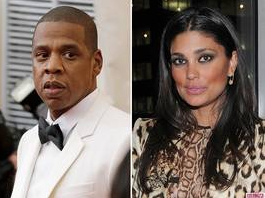 With or without his world-famous spouse, the hip-hop mogul, 44, will rub shoulders with about 120 other members of Kimye's inner circle -- including Rachel Roy. The last time Jay Z and the fashion designer interacted, things didn't go so well. During the Met Gala afterparty at NYC's Standard Hotel May 5, it was Jay Z's apparent chat with Roy, 40, that provoked his sister-in-law, Solange Knowles, to fly into a rage, sources told Us. That, of course, culiminated in Solange's infamous, memed-about elevator attack on Jay Z later that night. According to a well-placed source, Solange, 27, thought she saw Jay Z flirting with Roy as Beyonce looked on. "Solange yelled about Rachel on Beyonce's behalf, asking Jay, 'How could you treat my sister like that?'" the source says. "Solange walked up and started screaming at Rachel. She was making a big scene." While a Roy source counters that she and Jay Z didn't even speak that evening, the drama is regardless out of character for Roy, whose ex-husband Damon Dash was once Jay's business partner. "She's very into spirituality," says another source of the mother of two, whose designs have been worn by the likes of Sharon Stone and Penelope Cruz. People/media/blogs stop trying to make Rachael Roy happen, she is a on factor trying to come up. No body even knew who she was and still don't care who she is. Who matters is Beyoncé/Jay z and Solange real talk.